The accurate evaluation and maintenance of haemodynamic status of critically ill patients and/or high surgical patients is one of the most-important responsibilities of the anaesthesiologist and intensivist [1–4]. Haemodynamic monitoring consists of observing how the cardiovascular system responds to trauma, illness, injury, and therapeutic intervention. Despite continuous improvements in surgical and anaesthetic techniques, major surgery is often associated with complications occurring during the perioperative period. The ability to anticipate haemodynamic impairment in response to critical illness or surgical trauma and to detect adverse changes early is a major factor in preventing the development of a haemodynamic crisis. Despite this important issue, in the majority of patients undergoing non-cardiac surgery, we monitor the cardiovascular function only by the electrocardiographic signal, the invasive or non-invasive measurement of the arterial blood pressure and the continuous recording of the Sp02 and end-tidal CO2 (PetCO2). This monitoring is well recognized to be unable to detect the clinical or subchnical haemodynamic alterations during anaesthesia. In fact, in the face of a sudden intraoperative hypotension, in particular after the induction of anaesthesia, we cannot understand what is really happening because we do not know whether the hypotensive state is caused by a decrease of the total systemic vascular resistance (TSVR) due to vascular dilatation or there is a fall in the cardiac performance. Lastly, there may either be a myocardial depression with a low cardiac output or an increase/decrease of the TSVR. 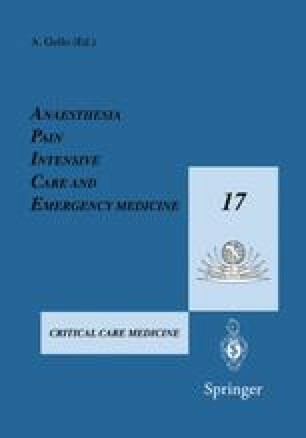 Thus, a lot of anaesthesiologists, almost automatically implement a dangerous lightening of anaesthesia, with the risk of awareness and removal of the autonomic nervous system protection and/or a quick refilling with normal saline or colloids. Despite the lack of a correct physiopathological diagnosis, both manoeuvres are often effective, probably because there is a real or relative hypovolemia in our patients and, thus, the blood volume restoration corrects the hypovolemia due to the vasodilatation during general anaesthesia. Furthermore, if the patients have a normal cardio-814 G. Galimberti, A. Agosti, R. Muchada vascular function, i.e., they are on the sloping part of the LVSW/LVEDP wave (LVSWi left ventricular systolic work, LVEDP left ventricular end-diastolic pressure), the refilling test increases the preload and consequently, by the Frank-Starling mechanism, the inotropic state. Cardiac output (CO) is a critical parameter ensuring the adequacy of tissue oxygenation. CO is the volume of blood ejected per minute. It is the product of the stroke volume (SV) times the heart rate (HR) and is expressed in liters per minute. SV is the amount of blood ejected per beat and it is determined by a combination of three factors: preload (the ventricular end-diastolic volume), afterload (the resistance against which the left ventricular ejects), and contractility (the strength of cardiac contraction). CO measurement by thermodilution was originally introduced by Fegler in anaesthetized dogs in 1954  and subsequently in clinical practice in 1970 by several investigators [6, 7]. Right heart catheterization (RHC) (also known as pulmonary artery catheterization) is necessary to guide therapy in critically ill patients and to improve patient outcome . Despite the adoption of practice guidelines  and the widespread use in hospitals around the world, pulmonary artery catheterization (PAC) has remained controversial and the debate continues about rational clinical use, estimation of cost-effectiveness and risk-benefit ratio . PAC provides valuable diagnostic information regarding myocardial function, including CO as well as the determinants of SV, and in some instances, the adequacy of oxygenation. These parameters are provided either intermittently or are delayed in time. The clinical limitations of PAC are thus determined by balancing the benefits to the patients against the not negligible risks and costs associated with using the technique.